The government’s been building robots in a secret program, and they look exactly like humans. They’d been building them for years before anyone outside the government found out. When the secret program was discovered, the leaders won public opinion over by offering robots up for sale to the public — who wouldn’t want a robot to do the cleaning and the gardening? But Vienna doesn’t trust them, not one bit. So when her mom brings a robot into the house to be their cook Vienna is horrified. But she soon learns there’s a lot more to robots than she imagined. That’s lucky for Vienna, because before too long one gorgeous specimen of a robot is the only thing that’s keeping her safe from the government that invented him. I was intrigued by the premise of this story: humans and robots in society, a human-robot love story to boot. 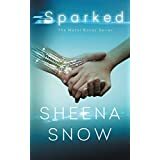 Sheena Snow has written an intriguing tale. Though Vienna is a teenager, this story reads more like an adult romance/adventure than a young adult novel. That’s not really a criticism; I simply found it surprising in a book that’s being marketed as YA. It’s an adventure and a love story, but it seems particularly unmarked by adolescent angst. It’s fairly violent but not sexually explicit. I was drawn in and read this fast-paced book quickly. A couple of unanswered details niggled at me as I read, but I can be an impatient reader and it may be that the author is saving the reveal for future books. Sparked is billed as the first book in the Metal Bones Series. I read this book courtesy of the author and Kate Tilton in exchange for an honest review. 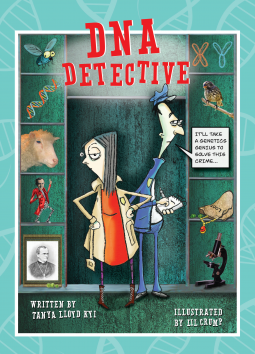 A middle-grade nonfiction book, DNA Detective tells the fascinating story of how scientists unraveled the mystery of DNA over the years. The text moves chronologically and from scientist to scientist as they advance the theories of how humans, animals, plants, and cells are created. The story is presented in a way that is both clear and interesting. With such a complex scientific topic, I expected to find this book either hard going or far too simplistic for middle graders, but I was very pleasantly surprised. Tanya Lloyd Kyi laid out the stories and the science in a very engaging and understandable manner. I think kids interested in science would be very interested to read this book. My largest problem with the book was that once introduced, the scientists were called only by first names. I don’t blame the author or publisher for this–I think it is the current convention for children’s books–but this middle-aged reader had trouble keeping track of Charles and Gregor and would have had an easier time with Darwin and Mendel. This book would make a great addition to classroom, school, and public libraries and a great gift for inquisitive kids. I read DNA Detective as a digital advance reader copy courtesy of Annick Press and NetGalley.